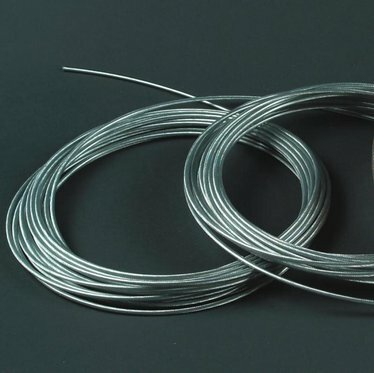 You will never have to adjust tautness with our 19- Strand Galvanized Wire Clothesline Cable. This product is extremely durable and tested to hold up to 1700 pounds. It can't stretch, snag, crack, snarl, stain or tear. But it will stand the test of time and help mother nature air-dry your clothes the right way! no stretch, easy to install , runs smoothly in the pulleys. I have been using this for 10 years now and today it broke. The vinyl coating will crack and allow water to enter rusting the wire. I never had an issue with rust stains on my clothes. Considering that the wire has been outdoors for 10 years, I think I got great use out of it ...and it has outlasted my friend's electric dryer! The clothes line is good but after 6 years or so the vinyl did start cracking. We're now having to replace it. This stuff truly is unbreakable. I've been using it for many years now. Today two heavy branches landed on the clothesline. The line handled it just fine. One of the *posts* bent, as well as the crossbar on the other side. So the posts have to be replaced, but the line will be reused.